The sweater is super comfy and actually really warm. 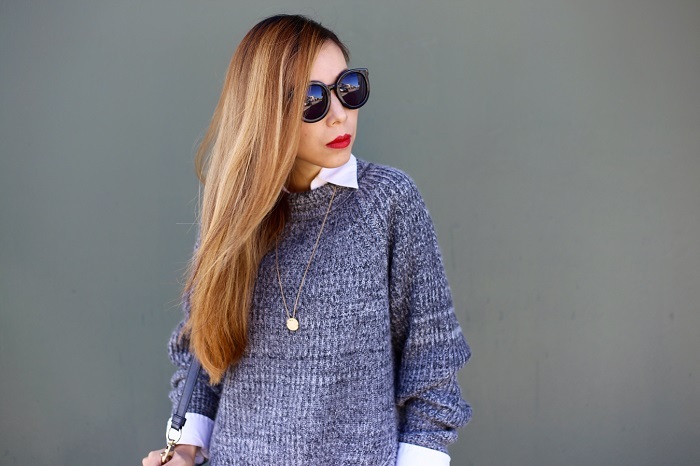 The color and shape of the sweater are also easy for winter layering. BTW, it’s currently on sale for $59. I’m working on a few new projects and it’s gonna be a super busy day. Happy hump day, babes! Love that sweater with those pants! Great look. Great comination of sweater and leather! Heels are wonderful! I like your hair! Oh you look absolutely stunning! Can never go wrong with the leather + sweater combo, can you? I am such a sucker for leather leggings!! I love this outfit you look fabulous babe! Wow, your outfits never disappoint! You look amazing! Love your neutral color palette! Love your outfit! so chic and great! What a great fall look! Love your sweater! Great outfit!